The islands off the coast of Thailand in the Andaman Sea and the Gulf of Siam are some of the most popular places for tourists to Southeast Asia to visit. Some of these islands are famous throughout the world for their beautiful beaches and party atmosphere. 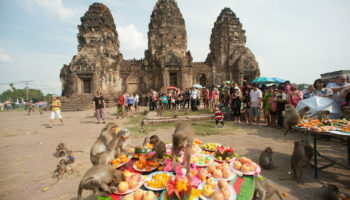 But the best islands in Thailand also offer numerous opportunities for recreation, spiritual exploration, and relaxation. Settled by sea gypsies, Ko Lipe is located in the Adang-Rawi Archipelago in southwest Thailand. It is a small island and visitors can walk around the island in little over an hour. Ko Lipe is just outside the jurisdiction of Tarutao National Park, and as such is exempt from certain laws prohibiting development. Its three main beaches have plenty of accommodations ranging from grass huts to air-conditioned bungalows. Ko Lanta is made up of a group of islands off the coast of Thailand in the Krabi province. The largest island of the group is called Ko Lanta Yai also known as simply Ko Lanta. Several beaches on the west coast of Ko Lanta Yai are each strung with a line of resorts and bungalows. This region is an important destination for snorkeling and scuba diving enthusiasts, who come to the islands to view the coral reefs and the ocean life, including manta rays and whales. There is also an abundance of tropical plant life, including the remnants of the ancient rainforests. Ko Samet is known for being a favorite respite from the bustle of Bangkok. Though the majority of the island is a national park, there are a number of vacation spots located there with different amenities depending on the type of experience sought. One of the great attractions of Ko Samet are its white sand beaches. Visitors can choose from peaceful and relaxing settings or popular beaches with lots of activities. Ao Noina, Ao Phutsa, Au Nuan, and Ao Wai are known for being more serene, and feature cozy accommodations and stunning sunset views. Hat Sai Kaeo and Ao Hin Khok are busier, and visitors to these beaches frequently come to sunbathe, swim, windsurf, or enjoy nightlife. Ko Tarutao is one of the 51 islands that belong to the Tarutao National Marine Park archipelago in southern Thailand. This island offers accommodations including campsites and bungalows that can be rented. Tourists to this island can enjoy the pristine and quiet atmosphere of the area, and can also view the rugged mountain and jungle scenery, including the limestone cliffs for which this part of Thailand is famous. Visitors can have a good chance of catching a glimpse at some exotic wildlife, particularly if they visit the beach on the western part of the island, which is frequented by large turtles. Ko Samui is one of the most visited islands in Thailand. There are abundant accommodations for travelers ranging from small bungalows to exclusive villas on the island. 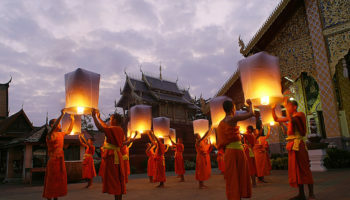 There are several festivals that take place every year on Ko Samui, including the Buffalo Fighting Festival, the Ten Stars Samui Art Party, and several street fairs with vendors selling local delicacies, clothing, and souvenirs. Sailing enthusiasts also gather for the yearly Samui Regatta, and triathletes and their supporters flock to Samui for the annually Triathlon Event. Ko Phangan is an island in the Gulf of Thailand, halfway between the islands of Ko Samui and Ko Tao. It is a famous destination for the backpacking community, who come to immerse themselves in the island’s natural beauty including rainforests and beaches. Every year the island holds an electronic dance festival known as the Full Moon Party. Those tourists who would like a more serene getaway are keen to visit Ko Pha Ngan’s numerous Buddhist temples. The island is also known for its beaches and meditation retreats. 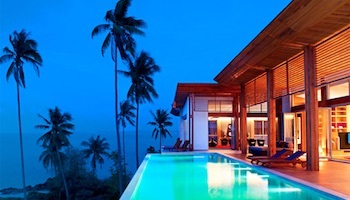 Phuket is the name of both a Thai province and the main city of that province. The province of Phuket covers a large island and several smaller islands off the western coast of the mainland. 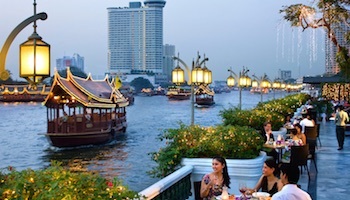 Outside of Bangkok, it is the most popular tourist area in the country, and many of its scenic beaches feature numerous resort accommodations for visitors. Close to these beaches, tourists will find thriving nightclubs and shopping areas. 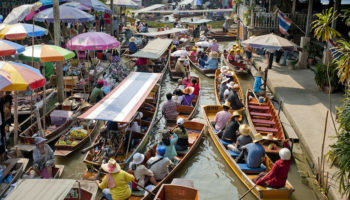 Some of the other attractions on Phuket include golf courses, historical museums, and monuments. Located near the border with Cambodia, Ko Chang is the third largest island in Thailand and the biggest in the Ko Chang Marine Park archipelago. It is a mountainous island known for several waterfalls, thriving coral reefs, rainforests and long white sandy beaches. In less than ten years, Ko Chang has become a major tourist destination in Thailand although still far quieter than islands like Phuket or Ko Samui. White Sand Beach is one of the most popular beaches on the island. Located on the island’s northwestern corner, it’s the longest beach on Ko Chang. The central section of the soft sandy beach is lined with resorts and hotels. Ko Tao is fast becoming the favorite destination of those who come to Thailand for recreational purposes. The island’s caters especially to scuba divers, rock climbers, and hikers. Around 7000 new divers get certified on Koh Tao each year making it one of the most popular destinations in the world to learn to dive. Fishing enthusiasts also visit the island in increasing numbers, hoping to catch a specimen of one of the abundant marlin, snapper or barracuda. 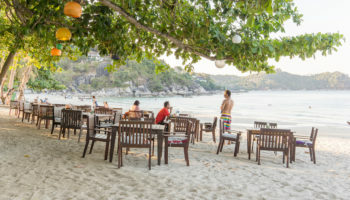 With the exploding tourist population of Ko Tao, a number of resorts, bars and nightclubs have opened up, though it is still possible for those seeking a more relaxed vacation to find quieter, less developed areas of the island. Ko Phi Phi is a small archipelago in the Krabi Province in Southern Thailand. Ko Phi Phi Don is the largest island of the group, and is the only island with permanent inhabitants while the smaller Ko Phi Phi Leh is famous as the filming location for the 2000 movie “The Beach”. Ko Phi Phi was severely hit by the Indian Ocean tsunami of December 2004, when nearly all of the island’s infrastructure was destroyed. Redevelopment has, however, been swift, and services are back with building regulations in place to limit the height of new hotels and other buildings to preserve the island’s stunning views. Which islands in Thailand do you consider to be the most beautiful? I know that Thailand is just a great place to visit..but I still haven’t got their even once..I am planning to visit Asia in the next few years.and Thailand is number one on my list. Samui and Phuket should no way be on this list! Seriously! Too many tourists. Awesome pictures here, thanks for sharing! My all time favourite is Koh Phangan with Koh Phayam off the west of Thailand a close second. Nice list! 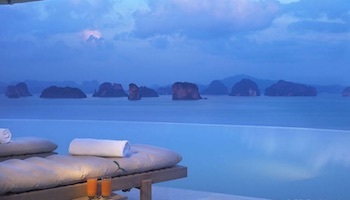 This summer I’m planning to go visit Thailand. Krabi is awesome. Phuuket too many tourists… Kho Phangan too many tourists and junks. Oh my! What a wonderful place to relax and unwind. I’m just back from Ko Chang/Elephant. Relax , quiet island from others beach. Cheer….! Had a month long holiday in thailand (ko samui,phuket.pattaya and bangkok) my 3rd time in thailand,and would love to do more island…just love the beaches! I lived in Koh Phangan last winter and I highly recommend it. Stay away from Haad Rin and all the drunken backpackers there. The northwest coast is much more laid back. Great sites, of those mentioned I have seen few Ko Lipe was lovely, my favourite, but it is a bit expensive. .. and how about Ko Surin further north which is my second most favourite place in Thailand! Out of the ten islands selected (and I have been to most of them) I would no doubt choose Koh Lipe, for it is the smallest and quietest of them all and, while not in high season, is an oasis of calm and relax. I haven’t been to those islands yet, Alejandro, so I can’t comment, though they are in my go-to list! 1.Koh Mun Nok is a private island with only one resort. We love it there , very peacefule, sparkling clear water , nice beach. It s a good place for people who just want a peacefule place to just so nothing but enjoy the nature. Koh Mun Nok is in the central part of Thailand. Take a boat off Rayong. 2. Koh Ta Chai is a virgin island in the south. It is a allowed only for day trip. Of the list to visit. It is less touristic place than Koh Chang. Beautiful beaches and peaceful. 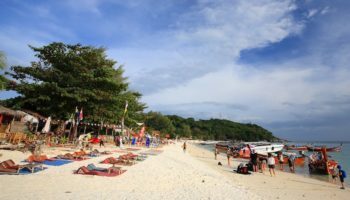 We have been to a bunch of these and I would put Koh Lipe higher on the list, but other than that good list! I’m traveling over to Thailand for 3 weeks in July. Can somebody email me the best route to take & the best time to spend on each Island? First 3 nights are in Bangkok, last 4 nights are in Koh Phangan due to the full moon party being our 2nd last night! It would be greatly appreciated! Having spent three weeks in Thailand with a week to go having been to Chang mai for elephant nature park which was excellent purely for the conservation and rescue of elephants not for riding or tricks. It was brilliant would highly recommend it with an overnight stay. I have to say that Phuket was very disappointing very crowded and not my cup of tea but when arriving at phi phi don was blown away staying on beach in a bamboo bungalow it was paradise. Leaving there for ko lanta but feel it is not in the same league and we are searching for the same type of paradise island to spend our last few days before we fly from Krabi on 19th march. Any suggestions??? @Linda, Though not an island, Railay (Rai Leh) near Krabi is also very beautiful. It’s only accessible by boat so it has a bit of an island feeling. My husband and I are going to Thailand in November, I wondered if anyone could tell me if you can actually visit phi phi from koh samui? @Jackie- The correct answer could be yes but it would not be an enjoyable trip as Ko Samui is located in the Gulf of Thailand and Phi Phi is located in the Adaman sea. Now if you did want to make this trip you would have to buy an airline ticket from Ko Samui to Phuket and take a ferry or speedboat out from there, that would be my recommendation anyway as the quickest way to get there. As far as the list I must say I enjoyed the read and thank you for taking the time to post it. 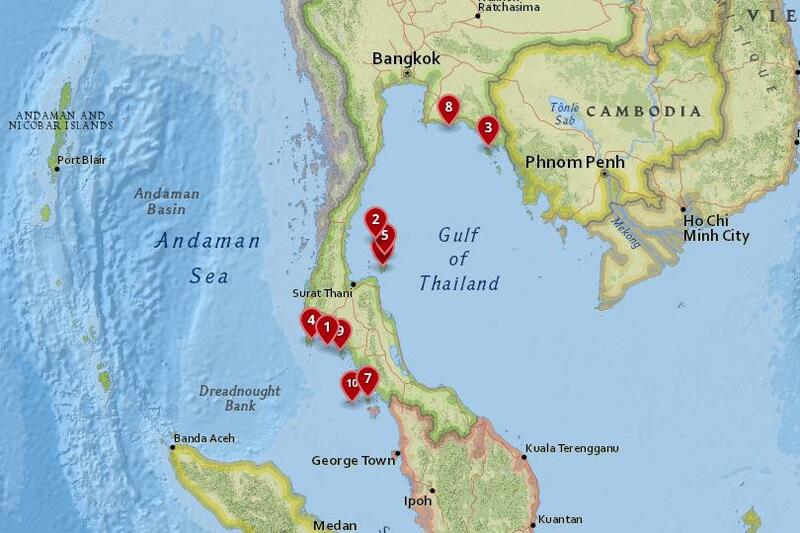 I spend about 4 months a year in Thailand now and have been to all of these locations starting back in 2003, most of these I have been too numerous times. So I will throw my opinion in on a few and you know what they say about opinion’s but I wont mention particular hotels etc… as I don’t want this to come off as an advertisement. 1- Koh Lipe- Truly a great place during LOW season to enjoy some beautiful beaches and everything is within walking distance, good food, drink and some great day snorkeling trips. It is more expensive but it also seems to be more of an adult crowd. On the flip side this place can be a nightmare during High (avoid if possible) season as it is packed and way over populated, not to mention very pricey during these times. 2- Koh Tao- Very first Island I stayed on and have been there multiple times. It was better prior to 2010-11 in my opinion before it became a hotter spot for the younger partying crowd. However it is still one of my favorites and you can still stay away from the noise if you choose too. Good food, drink, diving and we love to rent a motor cycle and head to the back side of the Island, the Island is small but still has a lot to offer. 3- Koh Lanta- This actually was the last Island we stayed on Sep of this year and I actually hate to mention it here as the secret may get out but you better see this one in a hurry because once the bridge is built connecting it to the mainland, it’s over as a quiet place to visit. We loved this place and had a blast, great atmosphere in old town, good food, plenty of shopping and this Island is big enough you can actually get out and take a motorcycle ride. The Island is top heavy to north with restaurants and such but we recommend finding a place down on the SW side of the Island to stay away from the crowd. Very nice Island and we are actually considering a place here long term. 4- Koh Ngai- You want to get away and spend some quality time with a loved one or family this is one of the quietest places I have been too. A little older crowd yes, loved the walk on the beach at night stopping off at the different resorts for happy hour and the sea food kababs at night were great. This is a small Island, no 7 eleven’s, night clubs and you wont need a scooter at all. Make sure to take the day snorkling trip, rent a kayak and the nature walks around the Island are great. Sorry had to ” Tapwarin Resort” was great. 5- Koh Phi Phi- Lets establish this right up front, prior to the Tsunami Phi Phi was top of the list and nothing truly was even a remote second. Phi Phi had it all and was a thriving little Island mostly controlled, ran and influenced by Thai’s who cared about you, customer service and provided a great atmosphere. Sadly most of them perished on that day and even though Phi Phi is trying to rebuild it will never be the same for me. Is it nice, sure, but the environment in the village is not the same and too much is now ran by other then Thai and the place is usually packed, a lot louder and younger partying night crowd now then before. 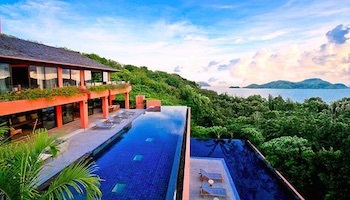 However the secret is staying on the NE side of the Island for true relax and piece fullness. Land at the dock and take a long tail boat to the resort. Go back tot he village area to visit if need be, good food, drink, sunsets and snorkeling once you get away from the party scene. 6- Koh Phangan- Loved this Island, been there many times and trust me I stay as far away as I can from the Full Moon Party as possible and that scene. Big Island and we enjoy the motorcycle rides, alot to do here as far as temples, great beaches, food and drink. This is a bigger Island and you can get away from the SW side if you choose. I do have to mention this, Buri Rasa Resort area and the little village right behind it is very enjoyable. You will see alittle bamboo hut with one of the friendliest Thai people you will ever meet and it is happy hour 24/7. Great time here as as I said still never been to a full moon party. 7- Koh Tarutao and Koh Mak are on the list for Feb 2016 so I cannot review yet and I have not been to Koh Chang yet either. 99- Phuket to me is good for one thing, a place to link up with a speed boat or ferry to get out to a real Island in the Adaman Sea. 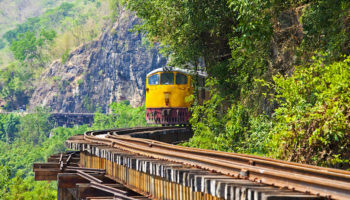 You can fly into Phuket or take the train from Bangkok and it is easy to get to the dock. As far as the Island goes it is way to busy for me and crowded, too much noise and traffic and more for the party crowd. Phuket has it’s place but I would rather spend my money on a real Island with piece and quiet. 100- Koh Samui like Phuket is good to fly into and link up with a speedboat or ferry to get to Islands in the Gulf Of Thailand. I cannot stand Koh Samui personally as it is way too big, populated, expensive for eevrything and the traffic is horrible. Way to many other then Thai people live here and also run business’s. The place is way too expensive and frankly it reminds me of Hawaii and the Island of Oahu. Again you want to party all night this is the place for you, you want piece and quiet on a small remote island, fly in and get out as fast as you can on a ferry to Ko Phangan or Koh Tao. @Exodin – Thank you, your post was exactly what I’ve been looking for. We’ll be visiting Thailand for the very first time in June/July with our two 18 year old sons. We’ll be staying for 3 weeks and coming from South Africa with its poor rate of exchange our budget is fairly tight. We will be flying to Phuket and then heading out from there, we were thinking of visiting Phi Phi, Koh Phangan and Koh Samui, however we have been a little put off by various blogs saying that Koh Samui is maybe not the best choice. Perhaps Koh Tao or Koh Lipe would be better? We are looking for a balance between some fun places for our boys as well as some time out for my husband and I. As you have been there many times, I would value your or anyone else’s suggestions please. I’ve been to thailand 5 times and visited most of these places, I think it’s only getting harder and harder to find a calm place these days. 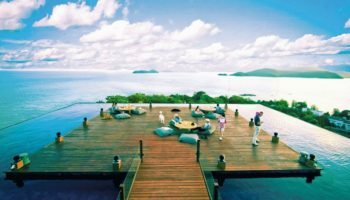 But if you’re a young traveller who wants to see the crazy night life, for example koh samui is great and the full moon party at ooh phangan is also an amazing experience. If you want to stay in a quiet place I recommend to take a boat to some of the small islands where you can’t find too many hotels. When I’ve been there I always change place after approx. 3 days and I recommend it, thailand is a great country to travel through and I recommend to go on day trips to different islands too. @ Lollie, I’m from Johannesburg, and contemplating doing a trip in December with husband and 2 kids, aged 11 and 14. Would love to read your feedback and would appreciate any advice and what to avoid. I live on Koh Samui and just love the island, when i go away i just cannot wait to see the island from the deck if the mainland ferry as i get near to home. Yes, there are a lot of tourists, mainly on the NE coast, Chaweng and Lamai, but go to the other side of the island and you will find quiet little fishing villages and beautiful beaches. That’s what i like about Samui, one can find whatever one wants, it only takes about one and half hours to drive around the islands ring road. Don’t just take my word for it, come and see for yourself, i have been here nearly 10 years now, been all over the world, but love it best here. Missing Koh Kradan! Is an amazing island, lovely beaches not many tourists and undeveloped which makes it more special. Lipe has one amazing beach, but for me that is it. To many tourists, island developed to fast. Koh lipe is amazing. We stayed for 16 nights in November last year. I can’t compare it to other Islands as this is the only one I’ve visited. However other travelers we met seemed to be in agreement that it was their favorite. Air Asia did a package which includes flights from Bangkok, mini bus to the pier and speedboat to the island at a very reasonable price. Be prepared to jump into the sea from your longboat taxi on arrival, so if your thinking “my luggage might get wet”, this probably isn’t the island for you.We thought prices were reasonable compared to Bangkok (80 bahts for a bottle of beer). The evening snorkeling trip to see the illuminous plankton was well worth the money. There is something for everyone from chilled out to Party til dawn. My recommendation would be to go before its spoiled. Photo No.7 is NOT Ko Tarutao. This is actually a photo from the private beach of Centara Grand, Ao Nang, Krabi. That is not to say that Ko Tarutao is not equally beautiful, it’s just not like this particular photo. Islands in Thailand are more than amazing. I have done 7 out of the 10 listed in your post. What I would suggest to people that want to visit several Thai islands in one trip is to rent a boat. Some are not too expensive and if you are traveling with friends this is actually a good deal.